Hotel 878 Libis – a new, affordable boutique hotel in Quezon City! Located along the major thoroughfare of C-5, Hotel 878 Libis is a new boutique hotel in Quezon City that offers comfortable and stylish accommodation at reasonable rates. It was my first time to stay in a loft-type hotel room. Despite being a smallish loft-type unit, my room was airy and spacious. The lower level was the living room with a small couch and dining table. Complimentary coffee was available on the kitchen counter. A glass sliding door led to a balcony overlooking the residential area of St. Ignatius Village, while a short flight of stairs led up to the warmly lit bedroom, equipped with its own A/C and flatscreen TV. Breakfast was already included with the room rates, while lunch and dinner can be ordered from a reasonably priced menu of Filipino and Western dishes. The security guards and receptionists were attentive and courteous. They were even quick to assist in hailing a cab for me back to Makati City when I checked out. Overall, my stay at Hotel 878 was quite enjoyable. On its location, there are both pros and cons. On the downside, the hotel can be difficult to get to during rush hour when C-5 gets jammed up with traffic, if coming from Pasig or Makati. So it’s best to get here outside the rush hour periods. 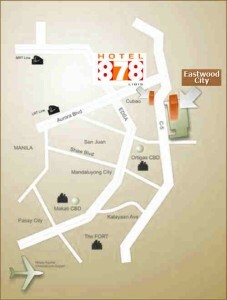 Otherwise, Hotel 878 is an ideal place to stay for those who need a hotel near the educational institutions of Ateneo University and Miriam College (8 km away) along Katipunan Avenue; the city of Marikina (6 km away); or the shopping and entertainment complex of Eastwood City (only 1 km away). The nearest metro station is LRT-2 Santolan (3 km away). Get 30% off the regular rates for all online reservations, starting at PHP 1,900 for a deluxe city view room, with check-in dates that fall from Tuesday to Friday. For more information, visit their promo page. Promo valid until December 31, 2013.